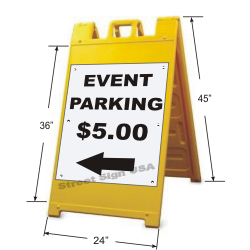 The Signicade A-Frame Sign Stand is the most popular stand in the industry! 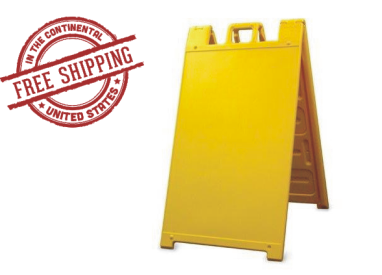 Made of heavy duty impact resistant plastic, this stand will last for years to come. Mount metal, plastic, wood, or composite panel signs by simply screwing them into place! Installing vinyl lettering or decals on both sides can be achieved as long as the surface is properly prepared. Signicades can be internally weighted with dry sand to prevent them from blowing over on windy days. FREE GROUND SHIPPING ON THIS ITEM TO ANYWHERE IN THE CONTINENTAL U.S.! All plastic frame can hold a 24"w x 36"h sign on each side. Recessed sign areas and stacking lugs help to protect the sign faces. Locking hinges prevents frame from opening "flat." Isopropyl alcohol & flame treating is recommended for prepping the display areas if applying vinyl graphics directly to the Signicade face. Click here for installation instructions on all signs. When internally weighting the Signicade with dry sand, pour no more than 6" inches on each side. Frame may bend if too much sand is used. Collapsible to within appx 4" of depth, along with a molded-in handle, the Signicade is easy to store and transport!